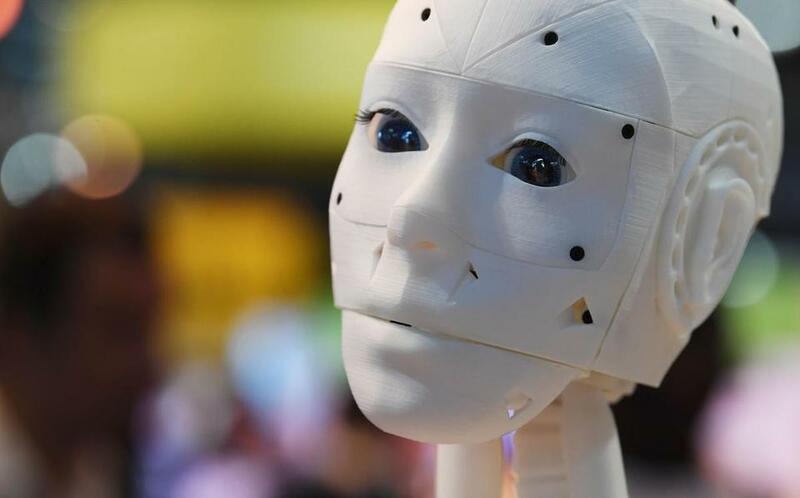 A 3-D-printed life-size robot is pictured at the InMoov corner during the VivaTech trade fair. Sure, the unemployment rate is the lowest in nearly two decades, but for how long? As more jobs are taken by robots, self-driving trucks, and other smart machines, will some of us face a future without work? Don’t count on it. Scientists and academics meeting this week at MIT Technology Review’s EmTech Next conference to discuss the future of artificial intelligence seemed sure of one thing: there will be plenty for humans to do — especially tasks that require the kind of intuition and emotional empathy that computers are nowhere near able to match. Mindell noted the computer-controlled lunar lander that put the first men on the moon nearly messed up the landing. Astronaut Neil Armstrong had to overrule the computer and set the ship down by hand. In the same way, he said, factory or warehouse robots must be designed to handle tasks that they can completely master, while calling for human help when unexpected problems arise. Daniela Rus , director of MIT’s Computer Science and Artificial Intelligence Laboratory, noted that artificial intelligence systems excel at deep legal research once done by skilled attorneys. But, “machines are not able to write compelling briefs. Machines are not able to counsel clients, and machines are not able to persuade judges,” Rus said. In law, as in manufacturing, there will be a division of labor between machines and people. Brown University computer scientist Stefanie Tellex works on speech interfaces to allow humans to control robots with verbal commands. “This is a real hard problem, even for new modern state of the art deep-learning methods,” Tellex said. But she’s getting good results from a new program that allows the robot to ask questions to its human colleague when the machine doesn’t understand a command. Perhaps the biggest surprise of the day was some unexpected career advice: Think twice about studying STEM, or science, technology, engineering, or math subjects. “I think we need to teach people how to deal less with computers and more with people,” said Iyad Rahwan, associate professor of media arts & sciences at the MIT Media Lab. With computers getting smart enough to program themselves, Rahwan said there will be less need for software engineers in coming years. Rahwan found an ally in Jason Furman , former chairman of president Barack Obama’s Council of Economic Advisers. “One thing machines are very good at is math,” Furman said. “What they’re not good at is empathy.” He suggested that more emphasis on “soft skills,” such as the humanities, might be the best way to keep future humans in the loop and on the job.